Simply an idol is image or statue of a deity fashioned to be an object of worship, which can be actually or symbolically. 1. 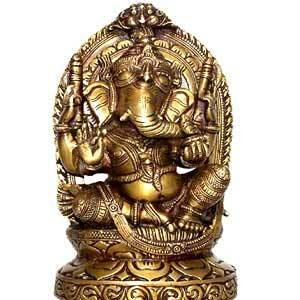 Pratima: it's a Sanskrit word that means: image or likeness of the deity. 2. Murti: a Sanskrit word that means “form” or “manifestation”. It's the most common name for a sculptural image of a Hindu deity fashioned by human beings, rather than those that are self-manifested (svayambhu images) forms of the deity. Thus, the murti is more than a likeness; it is the deity itself taken “form”. The uses of the word murti in the Upanishads and the Bhagavad-gita suggest that the form is its essence. 3. Vigraha: a Sanskrit word that means “form”, it refers to a sacred image or depiction of a deity. 4. Svayambhu images: the self-manifested images of the deities, it denotes any image of a Hindu divinity believed to exist by virtue of divine self-revelation, rather than by being made or established by human hands. These images are believed to be intensely holy and powerful, and to have a more pronounced sense of the deity’s presence. They mark instances where these deities have revealed themselves out of grace, in order to become accessible to their devotees (bhakta), and they are places where the deities are believed to be particularly present and “awake,” and thus more receptive to requests for favors. Svayambhu images can be found for each of the three major Hindu deities. Images of the Goddess are often natural rock formations, such as the image of the goddess Kamakhya, which is a natural cleft in the rock. From the previous terms we can conclude that idols are a part of static symbolism in Hinduism. Static symbolism may be further subdivided into two classes as we can see which may be called natural and artificial. An artificial symbol is chosen arbitrarily to represent a particular thing because it recalls the thing by virtue of its possessing analogous qualities or through association in thought. A natural symbol, on the other hand, not only symbolizes the thing in question but also manifests it in a mysterious manner on account of some hidden natural relation between the two. But, how do Hindu view god? Hindus view God as having both transcendental and immanent aspects. The Lord exists in his spiritual abode (transcendence) and is likewise present in the hearts of all individuals (immanence). Another aspect of God’s immanence is when he descends into our world as so many incarnations (avatars). Still another form of his immanence comes to us in the form of the Deity: Murti. God becomes manifest not only as incarnations but also in “material” images. Gods and goddesses are identified with specific iconography and every position of the hands or feet. Many deities have several hands, each carrying a weapon or a flower to protect the devotees from harm. Some Hindus interpret the many arms of a deity as representing omnipotence. The numerous attributes of the deities, as well as their weapons, are seen as symbolic of values, concepts, or qualities, and there is no general agreement on their interpretation. For instance, the conch shell and wheel of Vishnu are sometimes understood to be the weapons he uses to destroy evil, but others think of them as representing space and time. There is no reference to worship of idols in the Vedas. Early Vedanta teachings do not envisage idol worship or worship of lower gods. The question of whether these are “symbols” or reality itself has been much contested within the Hindu traditions. Some philosophical schools think of them as symbols leading a person through meditation and concentration to reality; others think of the icons in the temples as actual incarnations of the deity itself. Some Hindus think that, just as the incarnations of the Supreme Being as Rama and Krishna are real manifestations and not illusory or symbolic, the infusion of the supreme in the material body of a sculpture or icon is real. It's thought that the most majority of Hindus, tend to see the visible form in the temple as an alternate manifestation of god. But there are indeed Hindus who see divine images as merely a means to an end, a visible symbol leading to the “real” divinity, who is unmanifest. For those, the idol is a support for the neophyte. It is a support of his spiritual childhood. A form or image is necessary for worship in the beginning. It is an external symbol of God for worship. It is a reminder of God. The material image calls up the mental idea. Steadiness of mind is obtained by image-worship. The worshipper will have to associate the ideas of infinity, omnipotence, omniscience, purity, perfection, freedom, holiness, truth and omnipresence. It is not possible for all to fix the mind on the Absolute or the Infinite. A concrete form is necessary for the vast majority for practicing concentration. To behold God everywhere and to practice the presence of God is not possible for the ordinary man. Idol-worship is the easiest form of worship for the modern man. The follower of this view denies very much the existence of the first one, they denies the possibility that there's a Hindu who sees the idol as an alternate manifestation of the deity, they said that the misleading notion that Hinduism is fundamentally idolatrous was addressed in the context of Abrahamic religions by the 11th century Muslim scholar Al-Biruni. Some scholars argue that the idol worship in Hinduism originated from log-gods worship of the Gond tribes. But Sankara, who is the greatest writer of the Advaita Vendata school of thought, declared that worshipping the supreme through symbols or icons was for the alpa-medhah or religiously small-minded or undeveloped. Even most Hindus deny the existence of idol worship as they are the deities themselves, we can conclude –specially from the Brahma Sutras texts- that there are two phases of idol-worship in Hinduism, the phase of the religious immaturity and the phase of the maturity. The immature worshippers are those who confuse idols (symbols) with the realities they represent, and they use idols as the main core of their worship. Those who consider idols as not themselves deities, but merely specific places in which the deity condescends to dwell for the benefit of devotees. And those who just use idols as external aid to help them to fix the mind on the Absolute or the Infinite. Encyclopædia Britannica 2010, entry: "Pratima"
 James G. Lochtefeld, The Illustrated Encyclopedia of Hinduism, Vol. 1, Rosen Publishing 2002, entry: "Murti"
 Encyclopædia Britannica 2010, entry: "Vigraha"
 James G. Lochtefeld, The Illustrated Encyclopedia of Hinduism, Vol. 2, Rosen Publishing 2002. entry: "Svayambhu"
 "A school of Vedanta founded by Sankara, which teaches ‘non-duality’ view of reality, i.e. ultimate identity of Brahman and Atman", Klaus K. Klostermaier, A Concise Encyclopedia of Hinduism, Oneworld Publications 2003, entry: "Advaita Vendata"